Adriana is a 2 year old female mix. She is petite. She is 40-45#. She is very sweet and pretty. She ended up in a kill shelter, but rescue was called in as she was too sweet to die. She was quiet as a mouse in the car on the 2 hr drive home.....slept most of the way. 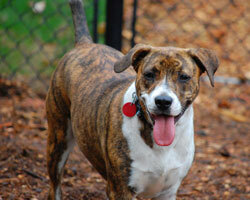 Walks great on leash, friendly with the dogs here, loves attention, all around good dog! She is here to be seen. She recovered from her kennel cough so will be immune for a long time. She will chase a ball and bring it back. She enjoys playing with another dogsl. She played with Dr. Everett's kids and was good with them. She doesn't seem to be aggressive in any setting I've seen her in. Sees a cat daily and doesn't seem interested. She is waiting to find her forever family and is available now! Come meet her Saturday, November 15 or Sunday November 16, noon to 4PM at our new facility at 604 Boston Post Road in Sudbury, MA. Angel is a sweet pup who ended up in a high volume shelter in TN. She is 25-30 lbs. She will be available on 11/18. Applications reviewed in the order received. Anna is a sweet Cocker Spaniel who was rescued from a puppy mill and then fostered in MD for a time. She was adopted and returned because the family couldn't keep her. She is a sweet pup, a little shy at first but not aggressive, just submissive. She will need lots of attention and positive reward-based training. Please fill out an application, then email us for an appointmenet to see her at our new adoption facility at 604 Boston Post Road in Sudbury. Regular showing hours are Sat and Sun, 12 to 4. 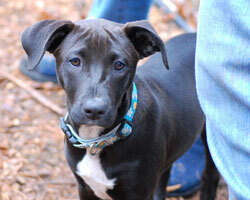 Bernadette is around 40#, 8-10 mo old, cute, playful, friendly with people and good with other dogs. Is extremely affectionate and thinks she's a lap dog. She's been known to flop over and give you her belly for some loving. She loves playing with big dogs. She is good in the car, okay on leash...could use a little more practice. She was dropped at a rescuer's house. This is a typical story from our rescue contact: A truck came by and I heard tires squeal and saw her trying to catch up with the truck. She came back to my yard once the truck was gone. She and Dover became good friends and played all the time. She deserves a loving adopter. In New England people are going to assume she's pit because of her markings, but her head is not shaped like a pit bull, so we're just not sure. BUT if you adopt her, you need to be prepared to deal with people thinking she's a pit bull. Available now. Come meet her Saturday, November 15 or Sunday November 16, noon to 4PM at our new facility at 604 Boston Post Road in Sudbury, MA. 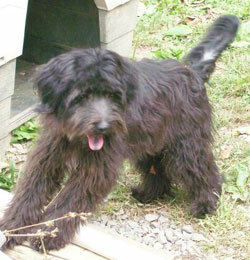 Blackie is a nine month old pup from WV. We think he's a Lhasa-poo, but can't guarantee. He's lightweight, maybe 20 lbs, but can jump five feet straight up in the air when he's excited. He likes to play and is a great dog for an active family. Not a dog to sit in a crate or be alone all day. He likes to be the top dog with other dogs even though he's a little guy. He thinks all the toys and food is his, so we're looking for a dog-savvy owner who will train him and set limits. He has a heart of gold and wants to learn, in fact he is a very fast learner and already responds to the clicker. Sleeps all night in his crate. He has learned sit and he sits for his meals. Does well in the car. Blaze was found by a trucker. The trucker brought him in to a vet's office and they took him in as a rescue dog. He is playful, very active and friendly. He has played with the vet's kids for a couple of months now....so used to kids. He is crate trained, good on leash and used to being indoors. Available after 11/6/08. Check Web site for showing details. Update: Boedi is now up to 55 lbs so he grew. He was pretty thin when he was rescued so we just bumped him to a large breed dog. We had lots of applications for him, but the situation may change as he is larger than we originally thought. Boedi is a 10 month old, neutered, mixed breed WV dog. We're not sure of the breeds, but some Beagle or Shepherd as he has the black saddle. His owner is moving and can't take him. She's exhausted all efforts to place him before she moves and can't bear the thought of taking him to the county pound. Neutered and vaccinations are current, including rabies. Housebroken, sleeps inside. She puts him outside on a lead for awhile when it's nice during the day. Is trained to sit on command, shake hands, as shown in pictures. He is leash trained. 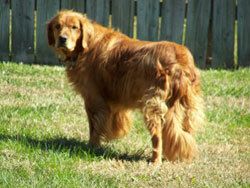 He is quiet and well-behaved and has done no barking, even when outside in the play yard. Weight was originally about 40- 45lbs, but he gained 10 lbs. after his rescue and being on regular meals. His coat is soft and clean (for now!). He is good with cats! He will be available after 11/6/08. 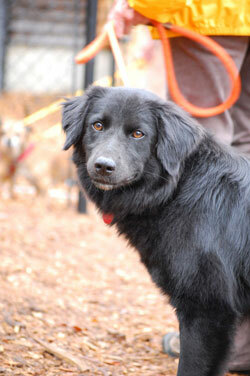 Calvin is an adorable 9 month old neutered male Collie mix. We're really not sure of the breed, something medium-sized. He is full of fun and will be a joy to have. He is a delightful pup who is joyful and playful and wants to please When he arrived at his Tennessee foster home he had mange, but his coat is nice and thick now. He is available now! He is active and very playful. He plays nice with all the other dogs at the adoption center and he now has a foster home in which he is well behaved and goes willingly into his crate. He loves to carry a stuffed animal in his mouth. Often when you let him out, he will run back to grab a stuffed animal. Last night he was burying something in the bark mulch and it was his toy, so sweet! He sees cats all the time, so could be fine with a cat, but should be tested first. He is fine in the car, getting used to the leash. Come meet him Saturday, November 15 or Sunday November 16, noon to 4PM at our new facility at 604 Boston Post Road in Sudbury, Ma. 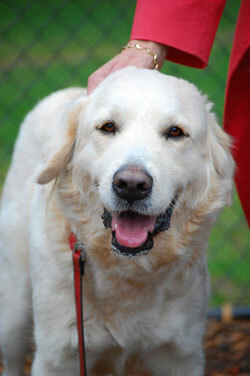 Chloe is a 7 year old spayed female Golden who is a very sweet girl. She is good on leash and good in the car. All she wants is a little love. She is very good in the house she just lays at your feet hoping for a pat. She gives kisses and is just an over all good dog. Her owner passed away. She was the husband's dog and was forced to live outside in the back yard and was not allowed to come inside very much. The woman who gave her up said Chloe would watch her and the two inside dogs through the glass door. She said Chloe loves to ride in the car, go for long walks, go with them when they went horse back riding. Chloe has a tendency to gain wt. and she has had her on a diet. Chloe is spayed, utd on shots. She is sad right now and upset. She needs someone to bond with and someone who will make her feel secure. She doesn't understand all the changes that have occurred in her life in the last few months. She is a good dog, good with cats, good with other dogs as far as we can tell and the owner said she was. A stay at home, please, for this dog. She's had too many losses to bond with a family and then be left alone all day. Holistic home (no cheap dog food) preferred. Dogs are allergic to corn, so a corn-based diet will ruin this nice dog. 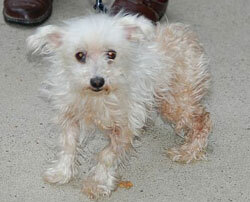 She will need good nutrition and daily walks, no pesticide-based flea/tick products, please. There are plenty of healthy alternatives that don't cause cancer. 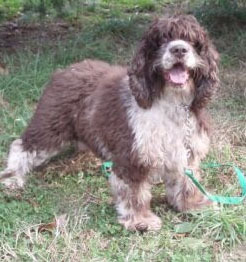 Choc is a neutered male Cocker Spaniel who was originally rescued from a puppy mill. His rescuer asked us to help place him, so we brought him up from MD. CHOC is adorable and affectionate. He loves to walk around carrying a red kong in his mouth -What a sweet sweet boy ! Just patiently waiting for a home.He's laid back and friendly. He is now clipped/healthy. He is UTD on vaccines including Rabies, HW neg. & on preventitive, leashbroken, non-aggressive, wormed,healthy and friendly. He is very clean in his kennel and will be in a foster home this week too. If you'd like to meet him, let us know after you fill out an application. He's a really sweet dog. Daisy showed up at a house near Memphis, TN. Daisy captures the heart of everyone who meets her. The woman who boarded her for a week,the foster mom, a vet tech where she was spayed and a neighbor of the foster mom all fell in love with her. The vet tech and neighbor of the foster mom wanted to adopt her. 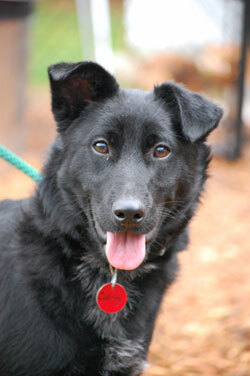 Our rescuer wanted her to be adopted in MA! Daisy is good with other dogs, good with people, good in the car, good on a leash, housebroken, knows some commands, loves to sleep in the bed with the foster mom and loves homemade bread. The foster made a loaf of bread one evening and was so looking forward to bread and jam for breakfast, but as it turns out, Daisy also likes bread. During the night she ate the whole loaf! She is spayed, utd on shots and is a great dog. I would guess her age as 2-3 yrs. Available after 11/17/08. 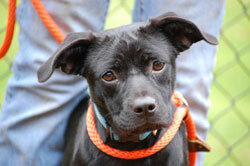 Ebony is a six month old Boston Terrier mix who will is available now. She is very cute! She is in a foster home and is very good in the house, she appears house trained so far. She is good with other dogs and loves to play. She is very friendly with everyone she meets and loves to give kisses. She is a great dog and deserves a good home. 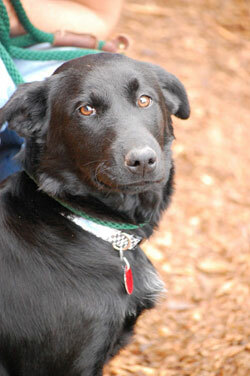 Her TN rescuer says: Ebony was dumped on a rural road near a county dumpster site. She came running up to me when I stopped to see about her. She was happy to be placed in the car and was so friendly. She licked my face and wanted to sit in my lap as we drove home! 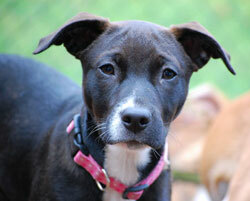 She is playful with other dogs and has a joyful personality. She looks like a Boston Terrier/Pug mix. She has features of both and will not be a very large dog. Seems fine with cats too! Come meet her Saturday, November 15 or Sunday November 16, noon to 4PM at our new facility at 604 Boston Post Road in Sudbury, MA. 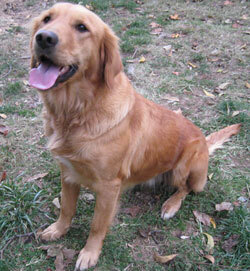 Gabbie is a two year old Golden who comes from TN. Her family moved and did not want to take her with them! 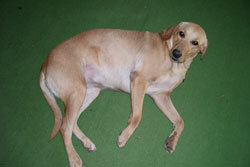 She is around 2 yrs old, good with other dogs and good with people. She is a little insecure.....would lower her head when I reached out to pet her at first. She now follows me around and runs and plays like a dog should. She plays equally well with Midas (15# pup) and Kaylee (50# shepherd mix). Available after 11/17/08. Applications will be reviewed in the order in which they are received, but holistic homes will be given preference as well as stay-at-home applicants. 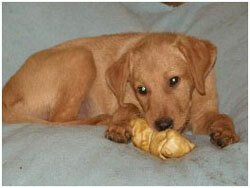 Gretta and her sister, Missy, were born to a stray dog in the woods and rescued by passersby when they were weaned. A woman saw them at a yard sale in a box in the hot sun without adequate water and shade. She took them and fostered them....and asked if we would help place them. She has kept them inside with her since taking them home. They sleep with her. She has crated them some, walked them on a leash and worked on housebreaking with them. Missy just got adopted and Gretta is available and she is a love bug. Come meet her Saturday, November 15 or Sunday November 16, noon to 4PM at our new facility at 604 Boston Post Road in Sudbury, Ma. 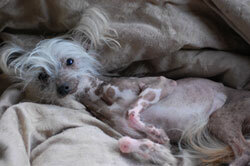 Hattie is an adult female Hairless Chinese Crested Dog. She was found in a kill shelter in TN and named Hattie because she resembled an old hat. She has no teeth, but that doesn't mean much as cresteds have horrible teeth and are born sometimes missing teeth. We will have our vet age her when she arrives and is examined two days later. Update: now that she's here, she looks much younger, like a young adult. she is so sweet. Needs to gain some weight, but just precious. Crested people, I know you're out there, otherwise, the volunteers will be fighting over her. We're already building a wardrobe for her. Foster mom says: "What she lacks in size, she makes up for in personality. Unless asleep, Hattie never stops moving. (a common trait of cresteds) You can always hear the pitter-patter of her feet on the hardwood, even when she is just standing. She spins when she gets excited and nibbles on your nose when she plays. She loves soft stuffed animals and can entertain herself by shaking the toy, throwing it across the room, and bolting after it. She is very skinny, and has a ways to go in terms of weight gain. Right now, we are feeding her 3-4 small meals a day to build her up. In terms of potty training, she hasn't had any accidents in the house, but whoever adopts her has to know that she needs lots of potty breaks throughout the day to reinforce her success. (Not to mention she is eating much more than a normal dog) She is a very easy going dog and just loves to love. 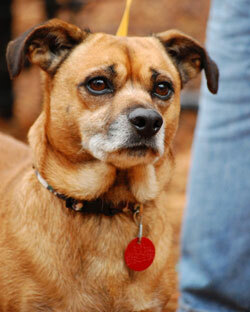 She is great with other dogs of all sizes and has the crested confidence- she isn't afraid of anything or anyone." 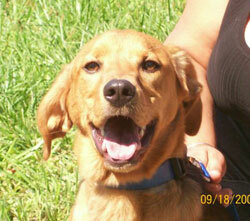 Indy is a sweet heart of a dog who had the misfortune to be born in the rural south where there are just too many dogs. He is one yr old, neutered a month ago, friendly with people and dogs, good in the car, good on leash. He was in a pen with Adriana and they are best of pals. He is around 65# and fully vetted. He will be available to be seen on or around 11/6/08. 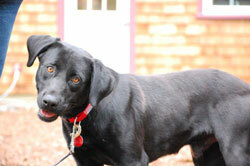 Indy is sweet and is a black lab...probably not full blooded, but looks lab. He loves hugs and will lick your face off if allowed! He is in with Adriana and gets along fine with her. She tries to get him to play and he just looks at her like "what are you doing?". He likes every person he's met. The guy at animal control really liked Indy and said he was a very good natured dog. The vet's office staff said the same thing. They commented that he could not get enough attention. Hopefully a stay at home or work from home for him, at least in the beginning until he adjusts. He was picked up as a stray. He did bark at the cat so would have to be tested before going with cats. JASMINE-rescued from a rescuer who is retiring. D.O.B. 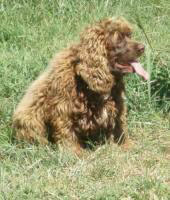 2001 SF Cocker Spaniel-milldog/ lovely girl, would make a great senior citizen's pet. Available after 11/17/08. 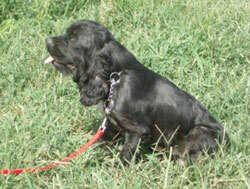 Kasey is a spayed female cocker who is coming from MD. She has to go to a home with no children. She is clipped/healthy. She is in MD so will be being transported up north and quarantined as are all our dogs. ALL dogs her dogs are milldogs, altered, UTD on vaccines including Rabies, HW neg. & on preventitive, leashbroken, non-aggressive, Mange, Ringworm and Flea free, wormed,healthy and old enough for transport, friendly.Will require housebreaking as they have been kenneled outside. This is easily accomplished because their preference is to do "it" outside. Most have no issues! Each dog comes with it's paperwork, new collar and leash, and adoption kit. Kaylie is a pure breed black lab female. She is 4 yrs old and has AKC papers. She is ball CRAZY. Will fetch all day and bring the ball back for you to throw it again. Her owner moved here from Alaska and still works 20 days/mo in Alaska and has no time for her. She is spayed and utd on shots. 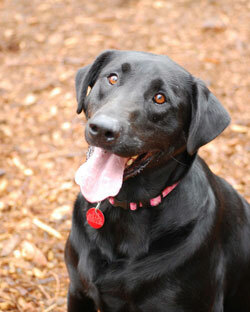 She has a lovely personality but is a typically active lab, not for a working family unless someone works part time. She is available to be seen on 11/6. She knows some commands. 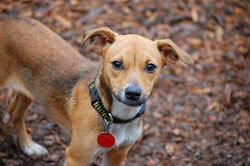 Littlebit is a 5 month old female JRT. She is as cute as they come. Just an adorable pup. Don't be scared off because of the breed. She is not pure and she is used to playing with kids. She's not fragile like some small breeds so can go with kids. When inside she will chew on a bully stick and go in her crate without prompting. She loves her crate. Her mom is a JRT and Dad is part Feist. Mom and dad weigh around 30#...so these should never be large dogs. We have a picture of the mom. Don't have a pic of the dad.....he was the neighbor's dog and has disappeared. These pups were born June 3rd. There are 2 males and 4 females for adoption. The pups are friendly and cute. They are used to children playing with them. They have been wormed and will be up to date on vaccines, but too young for spaying/neutering. She is very sweet and is just looking for a family to love. Mick came in with his brother, Nick. They are two Chihuahua mixes who were originally estimated to be about 8 years old, but our vet says no way as they have bright white teeth. Some dogs get the early gray muzzle so that may be why they thought they were older. They were owner surrendered to animal control in TN. Mick is a super friendly fellow who enjoys being in your company. He's playful, a good listener and very smart. He is great with other dogs, seems to think he's a much larger breed, and is great with kids. He'll be a wonderful family dog. He is great on the leash and just loves to take walks. He's doing well with the cats, leaving them alone now. He is adorable the way he runs around the yard. When you pet him, his little leg thumps. He and Adriana will run and run and he will let her tackle him and he rolls and rolls. He's so cute. Looks like a little old man. He loves the car, is great on a leash. Mick has a heart murmur, but we've found that dogs do well on Hawthorn so that would be our recommendation as well as monitoring at your vet visits. 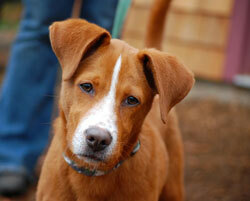 Come meet him Saturday, noon to 4PM at our new facility at 604 Boston Post Road in Sudbury, Ma. Gretta and Missy were born to a stray dog in the woods and rescued by passersby when they were weaned. A woman saw them at a yard sale in a box in the hot sun without adequate water and shade. She took them and fostered them....and asked if we would help place them. She has kept them inside with her since taking them home. They sleep with her. She has crated them some, walked them on a leash and tried to housebreak them. They need a little more work, but are almost housebroken. They are a little shy in new situations and with new people. We are placing them separately. The way to tell them apart is that Missy has white on her face and Gretta has an all black face. Available after 11/6. 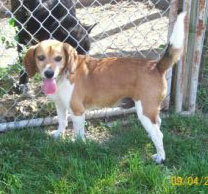 Rebel is a five year old neutered Beagle who came from WV. He's a happy boy and gets along with everyone. He was an outside dog but loves cuddling with you on the couch. He weighs 25 lbs. He is available after 11/6/08. He is extremely cute and affectionate. He will need help with housetraining as he's not yet housebroken. Crating will help. 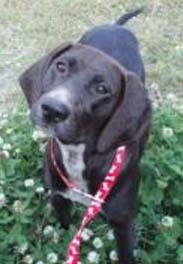 Shadow is a wonderful Lab mixed with either Bloodhound or Coonhound. This dog is really really sweet. She is shy at first, but when she is comfortable, she's such a riot, just a silly happy dog who runs around with her head thrown back, sniffing the air and smiling the biggest smile a dog could make. When she's not prancing around the back yard, she loves getting some love and pats or just laying around the house with you. We're looking for an adopter with a lot of love to give and possibley one who wants to adopt two dogs as her best friend in the whole world is Megan, who she loves dearly. She loves traveling in a car. She should not go with cats but is fine with other dogs. She went to foster with Meg overnight and her foster mom says that she is such a sweetheart and only took a few minutes to start coming out of her shell. She loves soft toys and loves to play. She also is full of kisses. She seems completly house trained and hasn't made a sound. She loved likes to play and wrestle. She slept through the night without a peep. She is a great dog and deserves a great life. It’s amazing that this little boy, who only weighs about 5 pounds, survived being a stray in West Virginia, where he was found dirty, matted, and very thin. Once upon a time, he must have been someone’s little baby, he runs in circles if you ask him if he wants to go in the car, he sleeps snuggled on the bed with his foster mom and doesn’t get off the bed all night (if it’s chilly he’ll go under the covers). He goes to the office with his foster mom and likes to stay in her lap while she works. He’s very friendly with everyone he meets, likes other dogs although big dogs barking terrify him, he’s very interested in cats and would probably like to chase them but when a cat walked up to him he was the one to run away. He would be a great companion to a retiree (and if you’re a snowbird he would fit in a carrier under the airplane seat) or someone who would like to bring him to work. He hates being crated and will yap until he falls asleep. If you are looking for a devoted little companion to spoil, this is the boy for you. He is in a foster home on the New York/Massachusetts border and can be seen by private appointment. 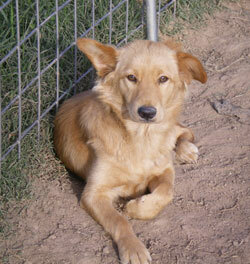 Sweetheart is a spayed female Golden/Pyr coming up from TN. Sweetheart is true to her name! She is one terrific dog. She looks like a golden in the face and her body is more of a pyr. She is gentle, great with people and other dogs. Don't know about cats. She was found wandering in a very rural area. Several people said they had seen her around that area for several days. A man took her in and put her on Craigslist "free to a good home" so our rescue contact grabbed her before she went to a give-away home and bounced around again. We got her spayed and up to date on vaccines and she is being brought to MA week of 11/4. She loves hugs, belly rubs and playing with other dogs. She can jump a fence, so needs to be watched. She is not a wanderer, but needs to never be left alone unsupervised in a fenced yard. She is good in the car, fine on a leash....but a little hesitant at times. I don't know how she is in the house for long periods, as most retrievers prefer to be with people all day. Everyone at the vet's office says she is one good dog! She never meets a stranger. She will be a wonderful addition to some lucky family! Zeeba is a 3-4 month old Golden Retriever mix. She was trapped by animal control when she was tossed out at a landfill in TN. She was terrified in the shelter and a woman rescued her from there. She has worked with Zeeba and says she is a little shy with new situations, but has come a very long way in a short time. Zeeba is cute, playful and friendly. She has been around two other dogs and is fine with them. She is full of joy and personality! Come meet her Saturday, November 15 or Sunday November 16, noon to 4PM at our new facility at 604 Boston Post Road in Sudbury, Ma.